Stems is a completely new way to DJ. A Stem file is an open, multi-channel audio file that contains a track split into four musical elements – bass, drums, vocals, and melody, for example. With each element available independently, you can mix in ways that just weren’t possible until now. TRAKTOR KONTROL S5 delivers essential control for Stems. Create instant on-the-fly edits, mash-ups, a cappellas, and more with hands-on creative control. And get detailed with your effects – add reverb to the vocals, and leave the rest of the track dry, for example. TRAKTOR KONTROL S5 two ultra-crisp high-res displays put TRAKTOR PRO 2 software in plain sight directly on the hardware. Browse for the next track, monitor effects, see Stems play as four stacked waveforms, and more all in vivid color. 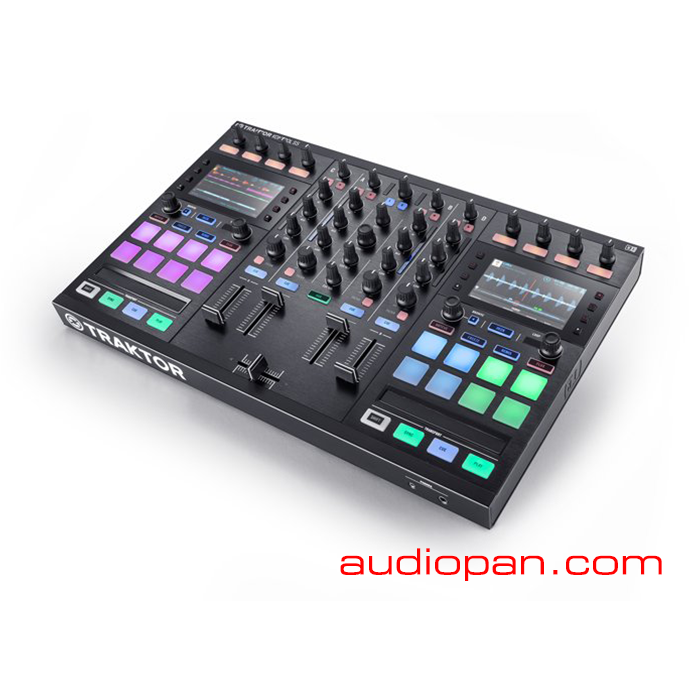 Just touch a knob and watch TRAKTOR respond on the displays – smart views, pop-up panels, filters, and effects values are instantly revealed by touch-sensitive knobs. TRAKTOR KONTROL S5 features creative tools that empower your unique style when playing tracks. Slice, rearrange, and beatjump in perfect time with Hotcue, Flux, or Freeze modes using the 16 color-coded pads. TRAKTOR KONTROL S5 is built for seamless control of the included TRAKTOR PRO 2 – the DJ software trusted by countless professionals worldwide. Get in-depth control of your music with up to four software decks, Stems support, customizable interface, and seamless iTunes library integration.